Illustrating a process with this diagram type helps company’s members better understand this process and what it comprises. Finding errors, drawbacks and weak points gets much easier with a detailed workflow representation in a flowchart. Flowcharts are very effective for explaining complicated issues to coworkers or team members, as they show the process step by step. These diagrams can also be used while brainstorming to visualize a problem, ways of solving it or what should be improved. As you can see, js flowcharts serve lots of different purposes. For that reason they’re applied in a wide range of fields. We’ll give several examples. Flowcharts are frequently used in programming to describe complex sequences and subjects like user’s path on the website, code structure or software architecture. Business modeling also benefits from js workflow diagrams for illustrating business processes, building strategies, visualizing infrastructure and other objectives. Process flow diagrams are considered to be handy tools for project managers, as they perfectly fit for showing steps of a project. Flowcharts are also popular in the field of enterprise resource planning to demonstrate the flow of human, financial, manufacturing or any other resources. Besides, they are often applied in scientific methods and research. Flowcharts can be used in numerous ways to visualize data due to the variety of graphic elements characteristic of this diagram type. You can combine flowchart elements in a unique way to illustrate what you need. In many cases a flowchart starts with a “start” shape and ends with an “end” shape, which mark the beginning and finishing points of a process. 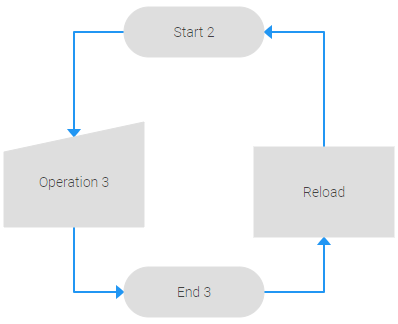 “Process” shapes are drawn in the middle of a flowchart as certain steps of a process, for example, as an action to be taken by users on the website. Meanwhile, process steps are based on “preparation” shapes that describe the conditions in which the process is flowing (for instance, user is not logged in). The “or” shape allows adding several possible outcomes of previous steps. You can also make use of “subroutine” shapes, which are predefined process shapes linking to an existing process in another flowchart. Among other common shapes are “database” and “document” shapes. Their names speak for themselves. Apart from shapes, connectors also play an important role for building a flowchart, as they show how flowchart elements are related to each other and guarantee that your diagram is read correctly. Our js flowchart is highly flexible. It’s always possible to add new shapes, delete the old ones or even start your diagram from scratch by using the related data collection API. If you’re satisfied with the shapes you have, but their content needs to be improved, you can apply the update method to place new data into your shape. Another option is to add horizontal and/or vertical scrolls for viewing your flowchart. Your process visualization can be easily saved, stored and shared with others if you export your flowchart to png or pdf. All that makes our library an indispensable tool for process visualization. Our documentation provides developers with more details of how to build flowcharts as well as other diagram types included in dhtmlxDiagram library. Find more diagram types on dhtmlxDiagram page and contact us if you have any questions.